As the world of indie rap continues to blow up and out, there's an even fresher strain of forward-thinking beatmakers and labels emerging, like the stellar, Cincinnati-born Mush imprint. Home to a slew of URB favorites (Busdriver, Thavius Beck, Her Space Holiday), the label trades in what one editor likes to call "hip-hop that doesn't sound anything like hip-hop" (see cLOUDDEAD, Octavius, etc.). In short, there's little traditional boom-bapping going on in these parts. 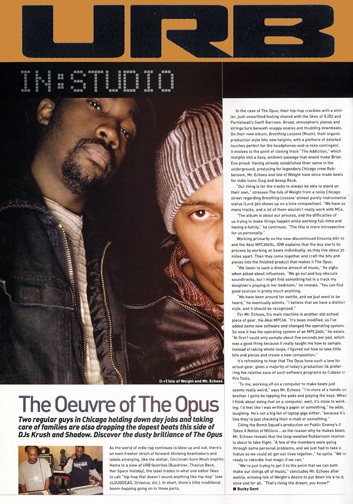 In the case of The Opus, their hip-hop crackles with a similar, just-unearthed feeling shared with the likes of RJD2 and Portishead's Geoff Barrows. Broad, atmospheric pianos and strings lurk beneath snappy snares and thudding downbeats. On their new album, 'Breathing Lessons' (Mush), their organic production style hits new heights, with a plethora of detailed touches perfect for the headphones-and-a-toke contingent. It evolves to the point of closing track "The Addiction," which morphs into a hazy, ambient passage that would make Brian Eno proud. Having already established their name in the underground, producing for legendary Chicago crew Rubberoom, Mr. Echoes and Isle of Weight have since made beats for indie icons Slug and Aesop Rock. "Our thing is for the tracks to always be able to stand on their own," stresses The Isle of Weight from a noisy Chicago street regarding 'Breathing Lessons' almost purely instrumental status (Lord 360 shows up on a lone composition). "We have so many tracks, and a lot of them wouldn't really work with MCs. "The album is about our process, and the difficulties of us trying to make things happen while working full-time and having a family," he continues. "The title is more introspective for us personally." Working primarily on the now-discontinued Ensoniq ASR-10 and the Akai MPC200XL, 10W explains that the duo starts its process by working on beats individually, as they live about 30 miles apart. Then they come together and craft the bits and pieces into the finished product that makes it The Opus. "We listen to such a diverse amount of music," he sighs when asked about his influences. "We go out and buy obscure soundtracks, but I might find something hot in a track my daughter's playing in her bedroom," he reveals. "You can find good sources in pretty much anything. "We have been around for awhile, and we just want to be heard," he eventually admits. "I believe that we have a distinct style, and it should be recognized." For Mr. Echoes, his main machine is another old-school piece of gear, the Akai MPC60. "It's been modified, as I've added some new software and changed the operating system. So now it has the operating system of an MPC3000," he extols. "At first I could only sample about five seconds per pad, which was a good thing because it really taught me how to sample. Instead of taking whole loops, I figured out how to take little bits and pieces and create a new composition." It's refreshing to hear that The Opus have such a love for actual gear, given a majority of today's production ilk preferring the relative ease of such software programs as Cubase or ProTools. "To me, working off on a computer to make beats just seems really weird," says Mr. Echoes. "I'm more of a hands-on brother. I gotta be tapping the pads and playing the keys. When I think about doing that on a computer, well, it's close to working. I'd feel like I was writing a paper or something," he adds, laughing. He's not a big fan of laptop gigs either, "because it's like their just checking their e-mail or something." Citing the Bomb Squad's production on Public Enemy's 'It Takes A Nation of MillionsÉas the reason why he makes beats, Mr. Echoes reveals that the long-awaited Rubberoom reunion is about to take flight. "A few of the members were going through some personal problems, and we just had to take a hiatus so we could all get our lives together," he spills. "We're ready to rekindle that magic if we can." "We're just trying to get it to the point that we can both make our livings off music," concludes Mr. Echoes after a while, echoing Isle of Weight's desire to put down his 9-5 once and for all. "That's living the dream, you know?"